Paul regularily updates his opinion on the current Utah County real estate market direction. He often discusses condos in these youtube videos with charts and graphs. It is wise to be familiar with the Provo Utah condo market conditions if you are planning to buy or sell a condo in the next few months feel free to watch the video below. Condos are selling again in Provo Utah. A few years ago a buyer could drive around Provo and find dozens of condos for sale. This is no longer the case. The Provo condos have been gobbled up by anxious buyers. In 2007 we had around 800 condos for sale in Utah County. 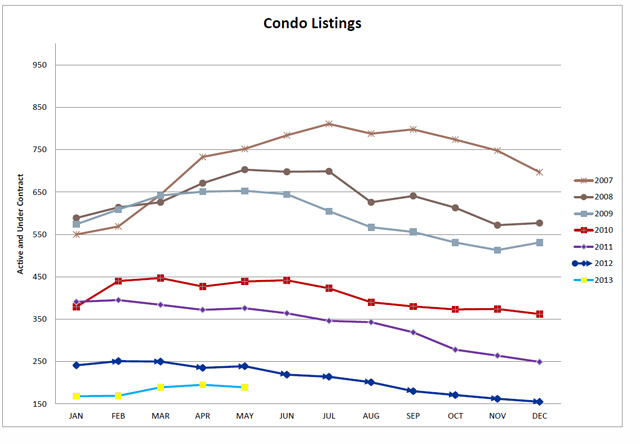 In 2013 we now have around 200 condos currently for sale. Provo Utah Condo Sales are on the rise. About 50 condos are selling each month in Utah County. Condos and townhomes are currently in great demand by the Provo UT buyers. Some buyers are calling and asking to purchase short sales and bank foreclosures. It is very difficult to find a condo in Provo Utah that is a distressed property. If a condo in Provo appears as a short sale it will typically have an offer on the first day. 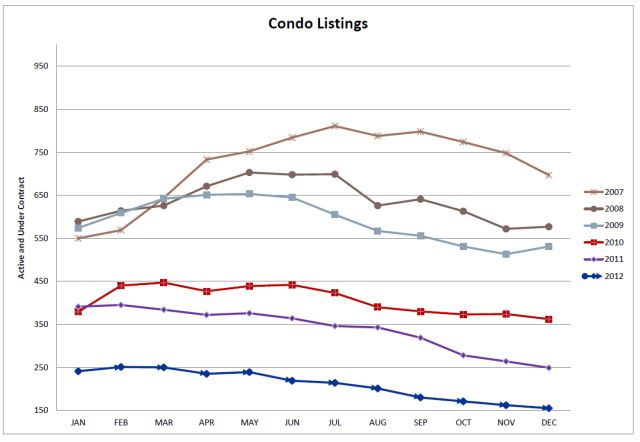 We are experiencing the lowest condo listing inventory in the last several years. If you look at the graph below you will notice that the listing inventory has dropped each year in a declining pattern. 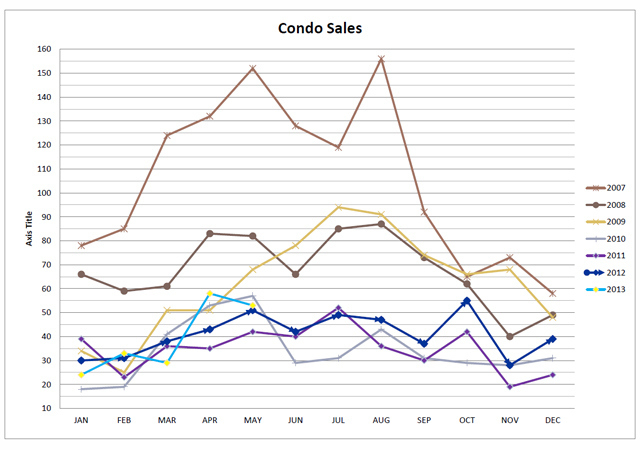 The lower the Provo Utah Condo inventory goes the higher the demand increases. It is simple economics. Lower inventory with a higher demand means prices will rise. If interest rates don’t go much over five percent I anticipate the prices of condos to slightly increase over the next two years. Interest rates have a strong correlation with Provo Utah Condo Sales. Provo Utah Realtors want interest rates to remain low. If prices go back up we don’t want this to happen quickly or our market could experience another crash. A slow steady increase in prices is the preferred method of appreciation. Provo Utah Condo Sales are on the Rise. If you are looking to buy or sell a condo in Provo UT contact Paul Teasdale of Team Teasdale Realty. Paul has sold several hundred condos and townhomes in the past 18 years. Paul is very familiar with the condos around BYU. If you are looking for a BYU approved condo contact Paul. The Condo Market in Provo Utah is very hot! We currently have 123 condos for sale. Out of that 123 condos we have 30 short sales. Most of the short sales in Provo Utah have not been approved by the bank. Search for Provo Utah Condos. About two years ago 50% of the Provo Utah Real Estate condos were short sales and bank foreclosures. Currently 24% of the condos in Provo Utah are short sales. Many of the short sale in Provo Utah have offers pending. This means if you want to buy a short sale in Provo you will have to look thru the few available without offers, wait in a back-up position or find a new short sale listing. Waiting in a back-up position on an unapproved short sale in Provo Utah is a terrible idea. Your statistical odds of getting a short sale condo in back-up position is perhaps around 10%. It is like buying a raffle ticket. If you are looking to buy a Provo Utah Condo you need to have our team send you a daily list of new condo listings. The Provo Utah Real Estate market has really been improving since January of 2012. In my opinion this is when the market began it’s true correction. Prices had been trending downward from 2007-2011. This was a five year downward run on the Provo Utah Real Estate Market. However, we should now enjoy a move in the positive direction. As you can see from the graph above condos in Utah County have not recovered to the 2007 highs. This may never happen. In 2007 we had between 120 – 160 Provo Utah Condos sell each month. 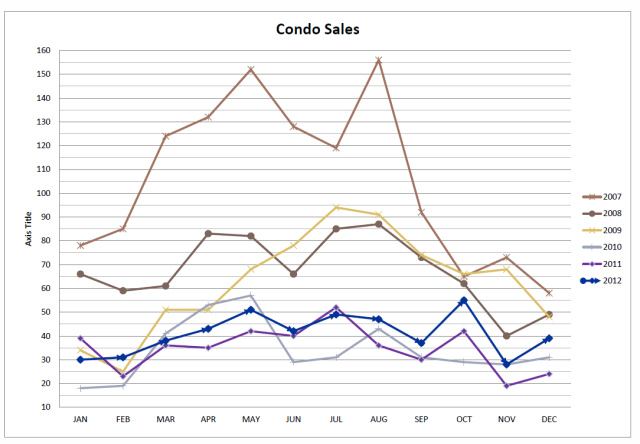 In 2012 we had between 30 – 60 Provo Utah Condos sell each month. The Provo Utah Condo market is currently very healthy with a decent amount of supply and demand. Provo Utah Condo Inventory has Dropped! In 2007 the number of condos for sale was closing in on 850. The number of Provo Utah Condos selling each month in 2007 was close to 160. Times have changed. In 2012 we had between 150-250 Provo Utah Condos for sale and around 30-60 selling each month. Why? The reason is simple. After prices fell buyers were able to afford to buy homes or twin homes instead of condos. The demand dropped and the developers stopped building condos. As the Provo Utah Condo inventory has decreased the demand has caught up to the supply pushing the prices back up. We currently have 23 Provo Utah Condos that are sale pending in Provo Utah. The prices range from $79k – $355k. We are seeing an increase in the condo demand. Provo Utah Condos around BYU did not experiences as much correction as condos in Provo further from campus. If you are looking to buy or sell a Provo Utah Condo hire a local Real Estate broker that is familiar with Provo. Contact Paul and tell him what you are looking for in a new condo or townhome. Paul may be able to match you up with a home that is not yet listed. If you are looking to buy or sell a condo in Provo Utah contact Team Teasdale Realty.